Best Pocket Square Holder:The Best Pocket Square Holder is a light weight durable product designed to HOLD THE FOLD of any pocket square or handkerchief permanently inside the breast pocket of a suit, tuxedo, sport coat or vest for work or a one time occasion. 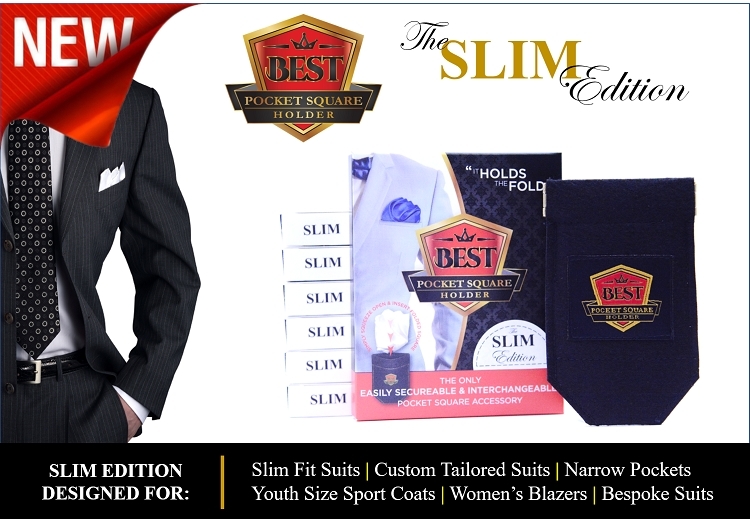 The Best Pocket Square Holder is now available in slim fit for those European cut suits/ Slim Fit suits. The Best Pocket Square Holder is a light weight durable product designed to HOLD THE FOLD of any pocket square or handkerchief permanently inside the breast pocket of a suit, tuxedo, sport coat or vest for work or a one time occasion. It is an essential for every man to have in his closet. "It is a suit jacket's BEST Friend!" Men can now maintain a professional, classic, trendy or formal look by following four easy steps. Just simply SELECT the pocket square or handkerchief of choice from your collection. STYLE the pocket square with a custom fold from our "How To" section of the website. SECURE the pocket square by squeezing the Best Pocket Square Holder open at the top and inserting the styled and folded pocket square. Then finally, INSERT the Best Pocket Square Holder in your pocket to maintain your style all day. The Best Pocket Square Holder should be in the closet of ALL men. Order yours today and begin your fashion journey!